A day after he worked Game 4 of the Hawks-Cavaliers series, it was made official. Mike Tirico is leaving ESPN, his home of more than 25 years, and moving to NBC Sports. Tirico’s last assignment for ESPN will be as a host for the European Championships in June. Mike Tirico, the play-by-play and studio voice for many of ESPN’s biggest events over the past quarter century, will join NBC Sports Group starting July 1. Tirico will work on an array of high-profile properties including Sunday Night Football, primetime television’s No. 1 show for five consecutive years; NBC’s new Thursday Night Football series (NBC is the only network with two primetime NFL packages); the Summer and Winter Olympics; select golf telecasts; and other big events. Tirico, the voice of ESPN’s Monday Night Football from 2006-2015, is one of four play-by-play announcers to work primetime NFL games for at least 10 seasons (Al Michaels, Frank Gifford, Mike Patrick). 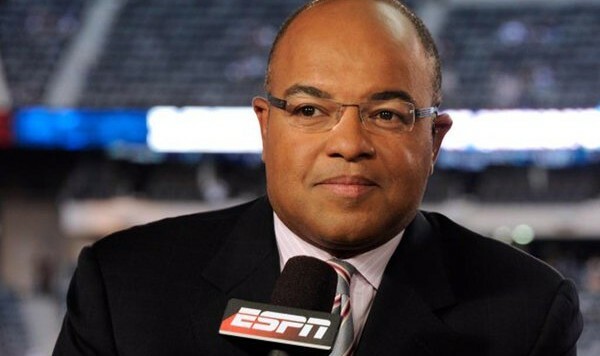 Tirico joins NBC after 26 years at ESPN/ABC (1991-2016), where he established himself as a preeminent broadcaster on properties and events including MNF, The Open Championship, The Masters, NBA, college football, college basketball, FIFA World Cup, and tennis’ U.S. Open and Wimbledon. He was named the 2010 Sportscaster of the Year by the National Sportscasters and Sportswriters Association (NSSA), an award voted on by his industry peers. The magnitude of this move shouldn’t be underestimated; it may just be the biggest sports media transaction since Dan Patrick also left ESPN for NBC a number of years ago. NBC now has someone who can be counted on to be the long-term face of their sports division after Al Michaels and Bob Costas decide to hang up the microphone. And when it comes to gifted broadcasters, NBC probably couldn’t have made a better choice across the entire sports media. Tirico’s July 1st debut means he’ll join NBC in plenty of time to work their first British Open telecast as well as this year’s Summer Olympics. Pingback: Jemele Hill: ESPN struggles are "a false narrative"
Pingback: Mike Tirico signs off ESPN: "Thank you for letting us in your house"
Pingback: What does Mike Tirico's future at NBC look like after TNF leaves?